Take Taco Tuesday to the next level with this recipe that’s far from standard. 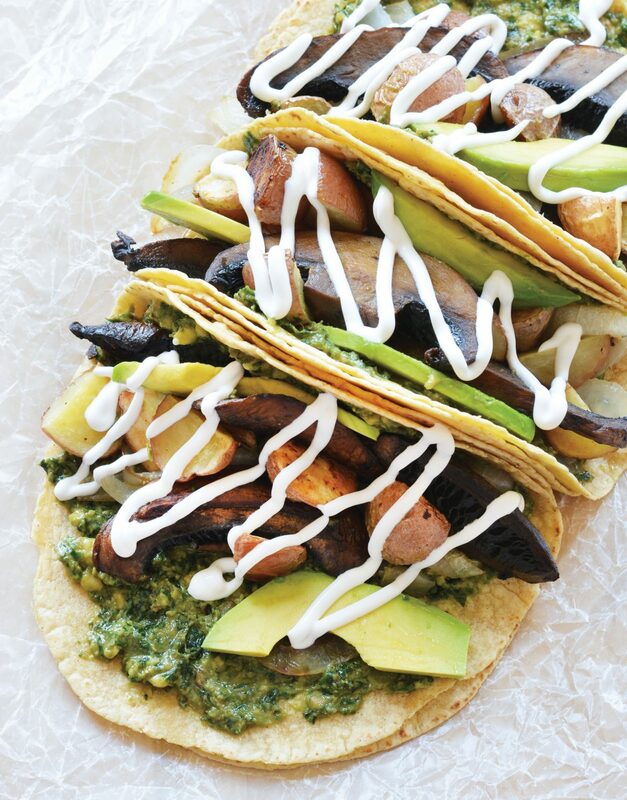 These tacos start with a hearty base of roasted mushrooms and potatoes, and are perfectly balanced with light and fresh pesto, avocado slices, and sour cream. 2. In a large bowl, toss the mushrooms, potatoes, and onion with the olive oil. Spread the vegetables out on a baking sheet. Sprinkle with salt and pepper. 3. Bake for 15 minutes, flip the vegetables, then bake for 10 more minutes. 4. To assemble the tacos, spread the tortillas with the Kale & Avocado Pesto, and top with the baked vegetables, avocado, and sour cream. Serve immediately. Combine all the ingredients in a blender or food processor and pulse until a somewhat smooth but still slightly grainy texture is formed. Transfer to an airtight container and store in the refrigerator until ready to use. This pesto is best enjoyed fresh, so use within 2 days. Crispy Cauliflower Tacos with Tangy Slaw + Avocado Crema Ta-Quinos!